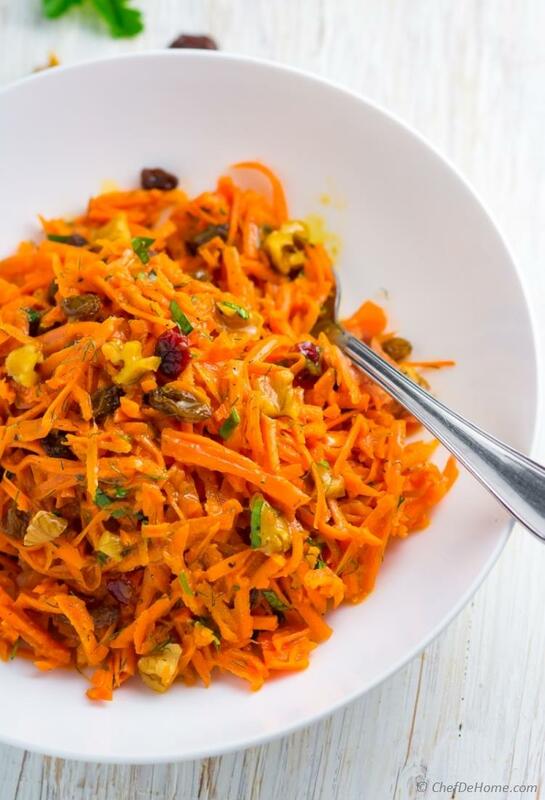 Moroccan carrot salad, a grated raw carrot salad with walnuts, raisins, and refreshing sweet-and-sour honey, turmeric and ginger dressing. Gluten free with at-least 2 carrots in each serving. So, let's eat more raw carrots but in a delicious salad bowl! For my love of salads, and zesty flavors, I keep very open mind for trying new things. Sometimes you get inspirations where least expected. Isn't it? 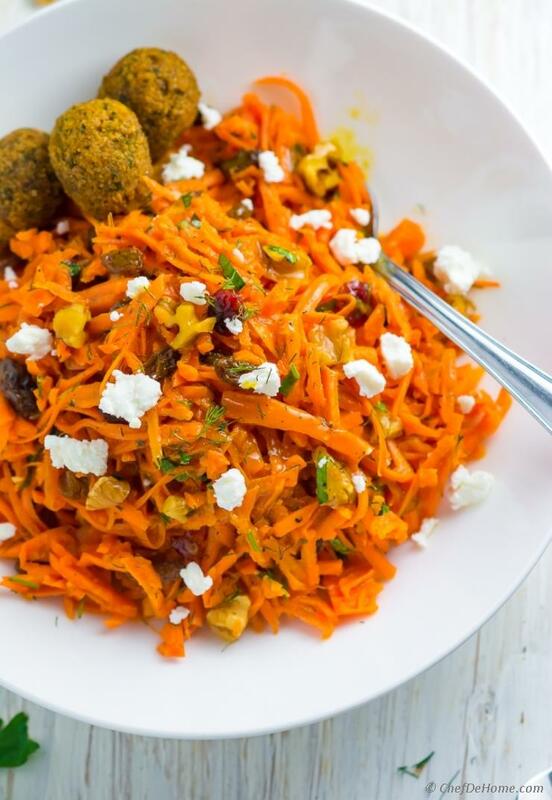 This zippy Moroccan carrot salad is example of one such pleasant find in a Greek restaurant. This was the time when we were packing our stuff last month. Whole house was upside down. Specially kitchen was half packed. So we decided to eat out.. nothing fancy, just something simple and quick. We went to Daphne's. I ordered a falafel plate with side of this Moroccan salad. I honestly love their falafels but that day Moroccan carrot salad won me completely. 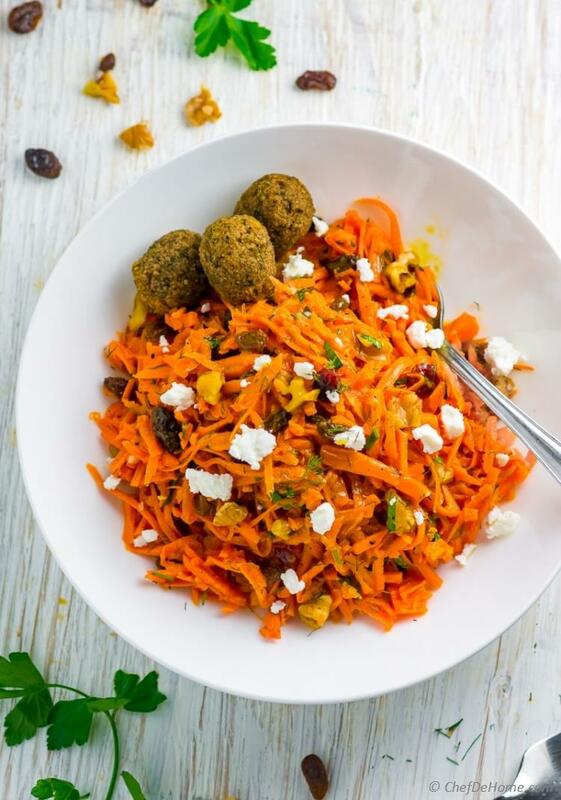 A raw carrot salad with refreshing sweet and tangy dressing, sprinkle of feta cheese and dill leaves with crunch of walnuts, and sweetness of raisins... OMG! So so good. I knew right away, blog is calling "Moroccan carrot salad", "Moroccan carrot salad"! The recipe for this carrot salad is very simple, yet has complex, sweet and sour flavors. When I first tried it, I felt I have made similar dressing before. If you have tried my Apple Chickpea Salad with Honey Mustard dressing.. that carry same flavor notes like this Moroccan Carrot Salad. Since it is a raw carrot and only carrot salad, the quality of carrots and chopping is very crucial to it's taste. For a good tasting salad, please use good quality sweet carrots. And ones only grated with coarse grater. In my personal experience, very fine grated carrots don't stand-out well to Moroccan dressing. If you don't have a coarse grater, the pre-packaged carrot slaw works perfectly. It also saves time of grating. Oh, if using pre-packaged, please make sure to buy only chemical spray free. I have another refreshing shredded raw carrot and kale salad recipe on the blog. I highly recommend trying it. If you like sweet and tangy peanut butter dressings, this salad will be your favorite very soon. This reminds me of my Moroccan dressing for this salad. 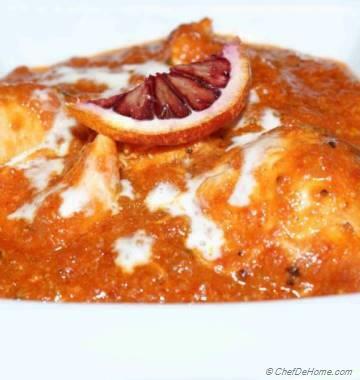 It is made with easy to find, clean, and simple ingredients. Vinegar, olive oil, ginger, honey, plus antioxidants from raw turmeric, and fresh cracked black pepper. It has no mayo or dairy, or artificial emulsifiers. 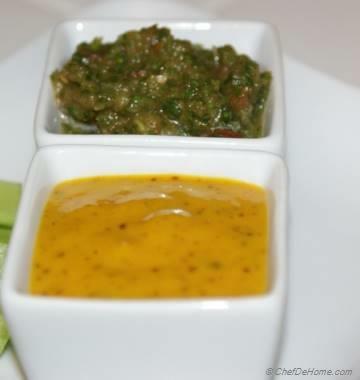 Lite yet silky dresssing without Mayo: To make a thick sharp dressing without any mayo/creams.. I added a teaspoon of yellow mustard in it. Mustard is not a traditional Moroccan ingredient but it compliments the sweetness of honey and tastes very good in this salad. It is like my secret weapon to creamy dressing without thickeners or too much oil. 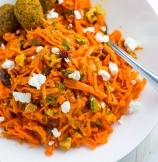 A quick sprinkle of dill leaves, feta cheese (optional) and Carrot Salad is ready to serve! I would love to hear what is your favorite carrot salad? Leave a comment below and let me know. 2. In a wide bowl, add all of the dressing ingredients. Whisk to emulsify. Set aside. 3. 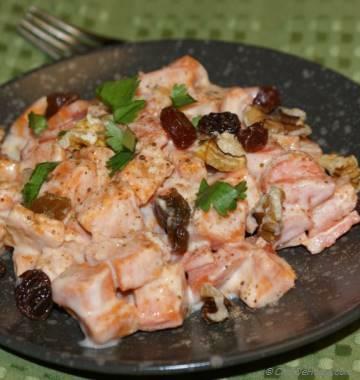 In a salad bowl, add grated carrots, and half of the dressing with walnuts and raisins. Toss well to coat carrots in dressing. Refrigerate until ready to use. Mix in remaining dressing and chopped herbs before serving. Enjoy! Hi Savita, Can you tell me whether the amount of Apple Cider Vinegar is 1 tablespoon or teaspoon please? Hi Carol, thanks for pointing out. It is 1 teaspoonful. But I usually adjust it per taste. I hope it helps.